Want to make sure you stand out from the rest? Want to turn heads? The Speed and Strength Lock and Load Textile Jacket will keep you equipped through it all. If you're between styles and riding seasons, this do-it-all jacket will have you covered and protected. The Lock N' Load Jacket is ready to take on a variety of conditions with a water resistant, removable 600D outer shell that, when not installed, reveals a fierce mesh chassis. You have all the ammo you need to hold back whatever mother nature throws at you with the large shoulder vents, a full length removable rain gutter/cover, and a removable thermal liner as well. But, it’s not only the weather that you are protected from! Speed & Strength has also included a full C.E. 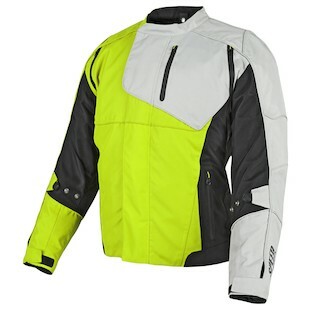 rated shoulder, elbow, and spine protector with this jacket. With 5 distinct colors (Red, Black, Blue, Orange, Hi-Viz) and sizes running from SM-3XL here is no shortage of options to fit your needs. If you like the Speed & Strength Chain Reaction but want a removable thermal liner and are sick of symmetrical designs, then look no further than the value, unique looks, and versatility of the Lock & Load.